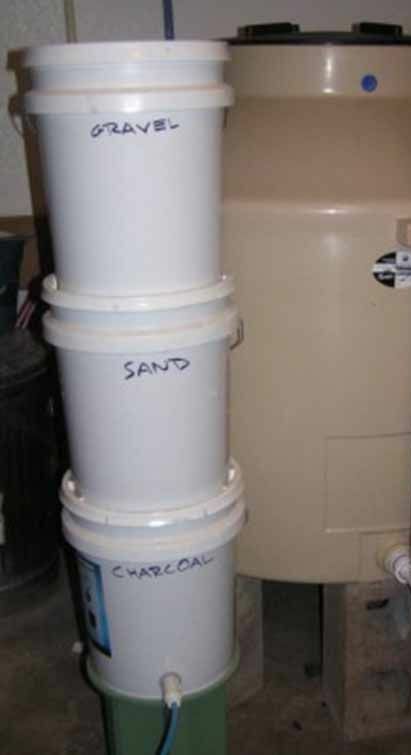 In a previous post we discussed how you can filter water using a five gallon bucket. Today we’re going to look at how you can build one of these water filters yourself, for an emergency situation, like a natural disaster. Lack of access to clean drinking water kills 1.6 million young children each year according to Unicef. The water filter we’ll build consists of four five gallon buckets, that work to filter successively smaller particles out of the water, until you’re left with relatively clean and safe drinking water. This is a relatively low-cost solution and in most circumstances preferable over having to boil water. 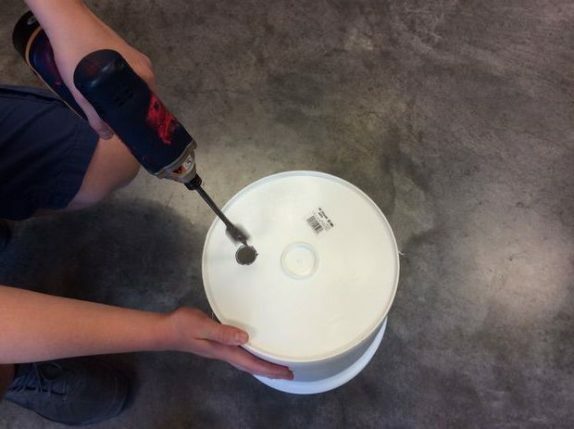 Step one: Drill a one inch hole at the bottom of three of the four buckets. Step two: Use a two inch hole saw and drill a hole in the lids of two of the buckets. Leave the lid for the top bucket alone. The holes don’t need to sit in the same places as the 1 inch holes. Step three: Take the screening and cut out a couple of three inch squares of the screening material for each of the buckets. To give it added strength, we’ll use more than one. 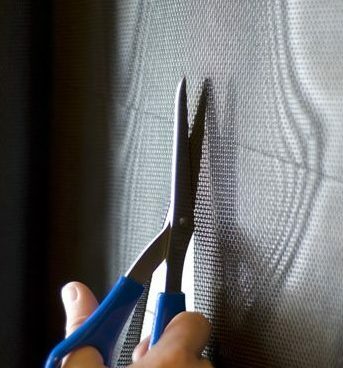 Use the epoxy to put these squares in place on the inside of the buckets, so that they cover the one inch holes. You may need to use something to hold the screening down, while the epoxy is curing. Step four: Put the ceramic tiles on the screening, shiny side up. Use a small amount of epoxy in the corners to fix the tiles in place. Step five: Now it’s time to prepare the filter medium. Take the activated charcoal you have. If it isn’t crushed yet, crush it first, until you’re left with very small pieces of up to a few millimeter. 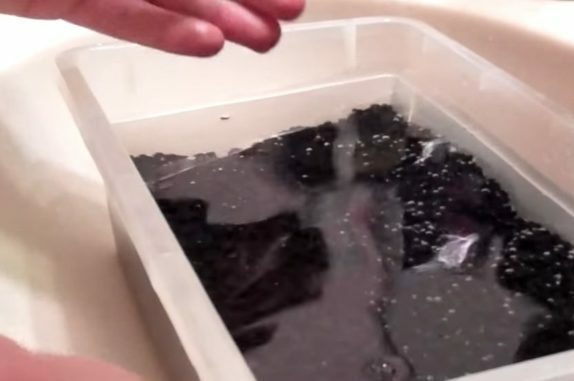 To clean your filter medium, put it in a bucket full of water and watch whether the water becomes cloudy. Keep rinsing the filter material until the water ceases to get cloudy. Do this for the gravel, the sand and the activated charcoal. When one of the filter mediums is clean, put it in a bucket, until you have all the filter mediums in a separate bucket. Step six: Put the lids on the charcoal and sand buckets. 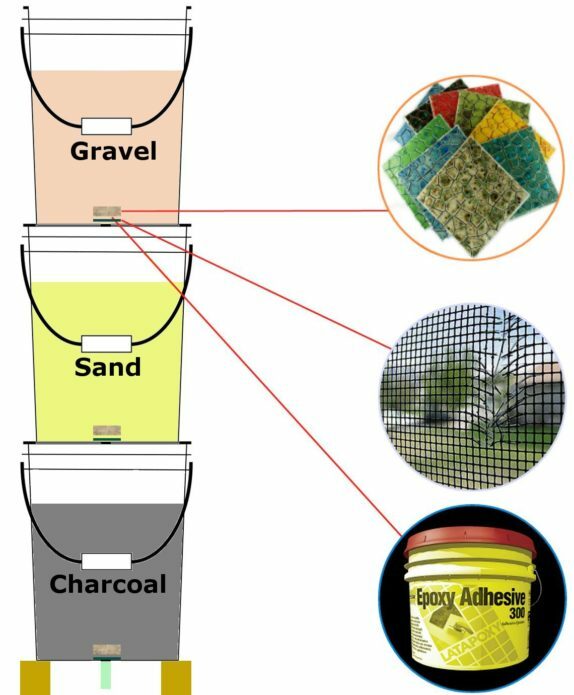 The charcoal bucket should stand at the bottom, on top of something so the hole at the bottom isn’t covered, the sand bucket on top of it and the gravel bucket goes on top of the sand bucket. Step seven: With your buckets in place, start pouring water onto the top gravel bucket, using your fourth bucket. At first, the water will come out cloudy. This is simply dirt that you didn’t manage to remove from your filter medium right away. Over time however, clean water will start to come out, that you can drink in an emergency situation. If you’re interested in preparing to make clean water, definitely check out our emergency bucket article too, where we have a big list of supplies that will come in handy when you have to live through an emergency situation. Governments in most countries encourage the population to store some drinking water as part of preparation measures for emergencies. This is sound advice, as it’s easier to stock up on drinking water, than it is to have to work on cleaning drinking water yourself on the spot. For this reason, always have a bucket or other container in your house that you keep filled with water. Store one gallon per person or pet per day. Store enough water to prepare for at least three days, up to twee weeks if you have enough room. Where do I get activated charcoal? Sand and gravel shouldn’t be too difficult for you to get. Activated charcoal is of course more difficult. It can be made naturally, but it requires high temperatures. We suggest you consider buying it in advance. As always, feel free to ask any other questions you might have in the comment section below, we’re always glad to give advice. Kind of a “cloudy” set of instructions… Are the tiles simply to hold the screen in place or do they serve another purpose? Will this filter remove anything other than particulates, ie: germs, cysts, chemicals, and in particular, odors, etc? Once water flows through, just how clean is it or would boiling be required to make it truly safe? I am assuming that the tiles are for filtering, also. Ceramic has tiny pores that work well for removing larger particles of debris and impurities. However, this states that you should use ceramic tiles as for a bathroom. That’s absurd! The same glaze that keeps your shower walls from being damaged by water, will prevent water from flowing through them as a “filter”! Unglazed tiles are harder to find (think rustic Mexican terra cotta tiles, or why not use pieces of terra cotta pots? ), but they are what you need. Ceramic is a commonly used filter medium in commercially available filters like British Berkefeld’s “Big Berkey”, and they have been in use for decades, so their effectiveness has been proven and accepted by experts who have done extensive testing on them. I’m curious about how the tiles are used as well. Do they act as flow restrictions between the layers?